The speculation started on Saturday when Andre Gurode was held out of the 3rd preseason game based on a "business decision". And now it is official. The Dallas Cowboys have released Andre Gurode. In the process of just a few weeks the Cowboys have gone from one of the oldest offensive lines in the league to one of the youngest. So the Cowboys have cut Marc Colombo, Leonard Davis, and now Andre Gurode. All of them were aging overprice veterans but the release of Gurode was somewhat surprising considering he had made it this far into the preseason. Gurode's last minute knee surgery this offseason probably cost him his job. While he stood around watching practice for the first two weeks of camp Phil Costa was impressing the coaches with his play filling in as the center with the first team offensive line. Costa was so good it made the coaches realize that there really was no drop off at center with Costa filling in. In fact, Costa showed athleticism and quickness that Gurode no longer possesses after his 10 years in the league. There are a lot of doom and gloomers lamenting the fact that this has turned into a rebuilding season. I completely disagree. What is going on is a change in philosophy mixed with some cap restructuring. Anyone who has seen the Cowboys offense in action at training camp can tell you that screens are going to be heavily used this season. No longer will the Cowboys go with the bigger is better offensive line and try to maul the opposition into submission with their offensive line. That approach hasn't worked the last few years anyway. By going younger the Cowboys will be a much better screen team because the younger players can get out in front of the ball carrier more effectively since they are so much quicker. So far there doesn't seem to be a sacrifice in the running game due to going smaller and cheaper. Pass protection is a major concern for me at this point. There will undoubtedly be protection break downs this season due to the inexperience of the offensive line. The hope is that the offense will be more diversified thereby keeping the opposing defenses from playing in attack mode on every play. Tyron Smith doesn't seem to be too much of a concern at right tackle. He has been solid this preseason but he still has a long way to go before he is a dominant player. But he seems better than what the Cowboys had a right tackle last year already and he will only get better with experience. Bill Nagy is going to start at left guard. Normally I would say no problem because it is easy to hide the flaws of a guard since they have help on both sides of them. But with a young center now starting next to him Nagy won't have that safety net. So he has to be ready now. I think he still needs to work on his strength and I fear that he might get overpowered by some of the stronger defensive linemen the Cowboys will face. Phil Costa is in his second year with the team. Normally that would mean he would have had an offseason with the strength and conditioning program to build up his strength. But with the lockout he missed out on that opportunity. And now he is sitting out likely until a few days before the season opener with a sprained PCL. That is certainly concerning considering his lack of experience and the missed time for the offensive line to gel as a unit. From a salary cap perspective these moves make a lot of sense. The Cowboys have overpaid for high priced free agents for the last few years and it has finally come to a head. Not only did they have to cut salary just to make it under the cap this year but they also have a lot of dead money counting against the cap next year thanks to those bad contracts. Going young is a great move as long as the young guys are actually ready to play. Time will tell if the massive overhaul of the offensive line was a good thing or a bad thing. It certainly seems like a good move in the long term. The hope is that there isn't a sacrifice in the short term. It is going to be very interesting to find out what exactly is going on with Andre Gurode. Jerry Jones said that he was sitting out because they need to make a business decision. I'm guessing there is a trade in the works but we will see. With Gurode out of the game the Cowboys had three rookies starting on the offensive line. While they did a decent job in pass protection you could tell that Romo was a little jittery in the pocket. He didn't step into he throws a few times and looked a little hurried on a few plays when there was no pressure on him. If Gurode really is gone then Romo is going to have to learn to trust the young guys very quickly. The run defense still looks soft. They just seem to be getting manhandled at the point of attack. I know Marcus Spears is out but I'm tired of seeing the opposing running back get 5 yards down the field before being touched. Sean Lee looked like one of the primary culprits on a couple of the big runs. Abe Elam made a nice tackle on a run early but he did a terrible job allowing a long touchdown pass. He should have intercepted the ball that Bernard Berrian caught for a touchdown but the ball just went right through his hands. I am starting to get concerned about whether the defense is ready for the start of the regular season. I know they are learning a new system and they will get better as the season goes on, but they are not very good right now. The offense might have to score a lot of points early in the season if the Cowboys want to win any games. The starting defense didn't come back on the field after half time. I would have liked to see them get more work. Brian McCann is was way too hesitant on his kick returns. He needs to either take the touchback or run up the field with a purpose. You can't half speed it up the field and expect to get many yards on a kick return. Kevin Ogletree got his shot to win the #3 receiver job outright. He had a chance for a touchdown on a beautiful throw by Romo down the sidelines but he failed to get his second foot in bounds. He did a nice job finding a hole in the coverage on a square in route. He also made an easy catch on a quick slant early in the second half. Dez Bryant looks primed for a huge season provided he can stay healthy. He caught a ball on a crossing route for a big gain. I love the way he always looks determined to score when he has the ball in his hands. The kicking battle still isn't settled. Dan Bailey made a 36 yarder look routine on his first field goal of the preseason and then hit a 41 yarder easily in the 4th quarter. Shayne Graham had a very short kickoff that allowed a big return, but he did hit his field goal and extra point attempt. Every one of Graham's kickoffs were short so you are certainly giving up the automatic touchback if you go with Graham over Buehler. Maybe Bailey wins the job because he has the accuracy and enough leg to get the ball in the end zone on kickoffs. Gerald Sensabaugh blocked a field goal after the special teams spent a lot of time working on field goal blocks in practice this week. Alan Ball picked it up and took it in for an easy touchdown. It sure would be nice if special teams could make a big impact in the regular season this year. Unfortunately Ball hurt himself on the return. Jesse Holley probably made the final roster with three nice first down catches tonight. He has always been a special teams ace but he needed to show something as a receiver to make the team this year. Felix Jones again looked like a guy ready to have a break out season. He didn't get many running attempts but he looked good on a few swing routes out of the backfield and had a nice 5 yard touchdown run. DeMarco Murray finally got on the field in the game. He had a couple of nice runs and really had a burst when he carried the ball. I'm glad he got some real work before the start of the regular season. I hope he gets more work in the last preseason game on Thursday. Martellus Bennett might be out for a while after getting his leg rolled up on at the end of a running play. He had to be carted to the locker room. Hopefully it isn't too serious because he is a big asset in the running game. It sounds like it is a high ankle sprain so it could be a while before he gets back on the field. Josh Thomas had a rough night but he looks like a guy who will develop into a long term player on defense. 1. Is the offensive line ready for prime time? The season opener is going to be on Sunday Night Football against the Jets. There will be blitzes and pressure coming from all over the place. The offensive line needs to be ready to go. It seems like we might finally have an idea of what the starting line is going to look like. From left to right it appears that Doug Free, Bill Nagy, Andre Gurode, Kyle Kosier and Tyron Smith will be the starters. The Vikings don't run a sophisticated blitz scheme like the Jets but they can put a lot of pressure on the quarterback. Hopefully we'll see an offensive line that can open running lanes and protect the quarterback. 2. Is the defense rounding into shape? Without the two starting cornerbacks it will still be tough to judge exactly what to expect from the defense. But I hope to see the missed assignments that have plagued the defense so far this preseason kept to a minimum. My biggest concern right now is the run defense because they have looked really soft up the middle on several occasions. 3. What can DeMarco Murray and Tashard Choice bring to the running game? Felix Jones is running like a guy who is ready for a break out season. But the depth behind him is a big question mark. Murray just started practicing this week so his playing time will probably be limited. But since he wasn't on the field for training camp I'm excited to see how he looks on the field. And Tashard Choice has a lot to prove based on the performance of Lonyae Miller and Phillip Tanner both in practice and in the first two preseason games. I have a feeling Choice is going to come out very fired up to prove his critics wrong. 4. Is Kevin Ogletree going to win the #3 receiver role or will the Cowboys need to start looking for a cheap veteran free agent? When Ogletree makes plays he always looks like a dynamic receiver who is capable of big things. But he also disappears at times. If he wants to be counted on in a more prominent role in the offense he needs to show that he can consistently get open and make plays. He'll get his shot with Miles Austin sitting out with a sore hamstring. 5. Will someone win the kicking job outright? Shayne Graham wasn't signed this week to be another training camp body. Clearly the Cowboys are either concerned about Buehler's hip injury, Buehler's inconsistency on field goals, Dan Bailey's inexperience, or a combination of all three. Shayne Graham wasn't sitting around in free agency for no reason. He really struggled early this preseason with the Redskins, but maybe he can find his groove again considering he is one of the best field goal kickers of all time statistically. But then again the Cowboys thought they had cured their kicking woes a few years ago when they signed Mike Vanderjagt, the most accurate kicker in NFL history at the time. The only way we'll know if Graham can get it done is if he gets a few opportunities. There are still a lot more unanswered questions about this team than I would hope at this point. But there are still potential solutions to all of the perceived problems. I'm just hoping that the solutions can be found before the games start counting. With the surprising news that Shane Graham was signed to battle for the kicking job a loud message was sent to David Buehler and Dan Bailey. It is pretty clear that the coaches aren't comfortable with what they have at kicker right now. And with Graham the team would have a proven kicker with over 10 years of NFL experience. Bringing in veteran kickers hasn't worked out very well for the Cowboys in recent years but I have to admit that I like the idea of Graham right now if he can out kick the other two guys over the next couple of weeks. I'm tired of wondering whether every extra point and field goal is going to go through the uprights. Maybe Graham can change that. The depth chart at running back changed dramatically today with the return of Tashard Choice and DeMarco Murray to practice. It will be very interesting to see how things play out at running back over the next two weeks. Murray has a great chance to make the final roster purely based on the fact that the Cowboys drafted him this season. As long as he can stay healthy heading into the season he'll make the final roster. Tashard Choice is going to have to battle with Lonyae Miller and Phillip Tanner for the third spot. Choice's lack of special teams value is going to work against him. It is possible that the Cowboys will keep 4 running backs but unlikely. Choice has his work cut out for him. Igor Olshansky has lost his starting spot and is now battling to make the final roster. If Olshansky isn't going to start it is hard to justify his $3.34 million cap hit. Working in Olshansky's favor is the groin strain that Marcus Spears suffered in the last preseason game. But the coaches seem pretty comfortable with Jason Hatcher and Sean Lissemore providing depth at defensive end. I'll be surprised if Olshansky isn't cut or traded in the next week or two. Wide receiver depth remains an issue. While the top three seem set at this point there is a lot of uncertainty behind Miles Austin, Dez Bryant and Kevin Ogletree. Dwayne Harris played great in the first preseason game but was invisible in the second game. Jesse Holley is almost exclusively a special teams player and the Cowboys might not have the luxury of roster space to keep a specialist. Raymond Radway has great speed but is very raw and inexperienced. And Manny Johnson hasn't shown much to prove that he deserves to stick around. I still think the Cowboys might look at a bargain free agent to help provide depth. On the offensive line the left guard spot is still up for grabs. David Arkin and Bill Nagy are locked in a battle for the starting spot while Montrae Holland recovers from a lower back strain. Nagy seems to have surged ahead in the fight but the next two preseason games will determine the winner. Either way the offensive line has become much younger and more agile heading into the season. You can see the difference when the Cowboys run screen plays because the lineman are doing a great job getting out in front of the ball carrier. I'm very interested to see how things play out at inside linebacker now that Keith Brooking is finally practicing again. Lee looked good in the preseason game but was invisible in the second game. With the complex defense that Rob Ryan is calling I have to believe that Brooking has a lot to learn. I'd like to see Lee win the battle because he is much more athletic at this point in his career than Brooking will ever be again. The defense was attacking from the start. Even without both of their starting cornerbacks Rob Ryan was attacking. They blitzed on 2nd and 3rd down on the opening series and forced a 3 and out. On the second series Abe Elam made a great tackle behind the line on a run blitz. The defense is definitely boom or bust because any time Rivers got time he could find an open receiver against man coverage. Barry Church made a great play to knock down a pass and force a field goal on the second series. It does seem like the starting defense is missing the two starting cornerbacks but it doesn't seem to be as big of a deal as it would have been in the Wade Phillips defense thanks to all of the pressure on the quarterback in the Rob Ryan defense. On a couple of plays no one covered the back coming out of the backfield on passing plays. I don't know if it was a hole in the coverage or a missed assignment. There was also a blown coverage on a Rivers to McMichael touchdown in the 2nd quarter. Patrick Crayton dropped a pass on the first play of the game. Anyone still want him back? Dan Bailey got a chance to handle all of the kicking duties with David Buehler out with hip soreness. Akwasi Owusu-Ansah looked better on his only punt return. He got up the field this time instead of dancing around. Felix Jones looked good running the ball again. Martellus Bennett and Tyron Smith both made some great blocks. On one play he threw down the safety at the end of the play with a Marion Barber-like stiff arm. I am really impressed by Felix Jones so far this offseason. He looks like a different player this year. The starting offensive line did a very good job while they were in there. They opened up big running lanes and they gave Romo time to survey the field on passing plays. Dez Bryant dropped an easy ball that would have been a first down. But he made a couple of nice runs after the catch on a wide receiver screen and a quick hitch. Romo started strong but threw a bad interception on a play action pass. Overall he looked comfortable in the pocket and was on target with his throws. His only bad play was the interception. He made a great improve throw to Witten to get the starting offenses first preseason touchdown. Martellus Bennett dropped a ball from Romo that was right in his hands and probably would have been a touchdown. Put that in your memory banks for later in the season. 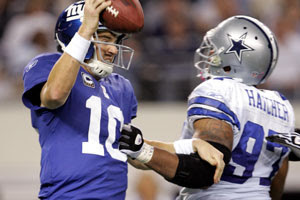 There is a reason that Romo doesn't trust Bennett and play like that don't help. John Phillips just seems to have a better feel for the passing game than Bennett. Sean Lee didn't do anything overly impressive but he also didn't make a glaring errors. It will be interesting to see if Brooking is able to get his job back once he is healthy. The defense is so much better at tackling this season it is hard to believe these are the same players. Stephen McGee still needs work. He always starts out slow and won't step into his throws all the time. When he does he is pretty good. I'm still not really impressed by Lonyae Miller. He does ok when there is a lot of space but he doesn't make anyone miss and he can't get yards unless there is good blocking. When he bails out he is terrible. And fumbling isn't going to help his cause. Phillip Tanner just looks much better than Lonyae Miller. I wouldn't be surprised if Tanner makes the final roster. David Arkin is looking better every week. I don't know if he will start but he looks like a keeper. Looking at wide receiver depth I was expecting to see more of Dwayne Harris. But it was Manny Johnson's turn this week to make big plays. Overall, the first team offense looked pretty good outside of the Romo interception and the couple of drops. The offensive line did an excellent job. On defense, there were still some missed assignments but there were some signs that they will be making a lot of big plays this year. But the defense still needs a lot of work. Unfortunately we didn't learn anything in the kicker battle since Bailey didn't get any attempts. The next preseason game is the dress rehearsal so hopefully we'll learn a lot more next week. The Revisionists Are Questioning the Crayton Trade? I can't believe this is still coming up. The media is trying to re-write history and call into question the trade the Cowboys made last year shipping Patrick Crayton to the San Diego Chargers. While it is easy to second guess the decision now, you have to go back to the 2010 preseason to really evaluate what the Cowboys did at that time. Too much has changed in the last year to now go back and re-evaluate the trade based on the current roster situation. Last preseason it really looked like it was finally time for Roy Williams to shine. And with Miles Austin and Dez Bryant filling out the rest of the top three receivers it didn't leave a lot of potential playing time for Crayton. And Crayton didn't like it. And he didn't mind talking about how he didn't like it either. And he even mentioned that maybe he needed to go to a team that could get him on the field. Given Crayton's history of causing controversy in the media the last thing the team wanted to do was force Crayton to sit on the bench and then listen to him whine to the coaches and the media throughout the season. Crayton had asked for his release right after the draft when the Cowboys picked Dez Bryant with their #1 pick. You can't forget that fact when you look back at the events that led to Crayton's trade to San Diego. So the Cowboys go what they could in a trade a shipped him off to San Diego. Problem solved. Or so it seemed for a while. Roy Williams started the season out on fire. Miles Austin was the clear #1 receiver with Williams and Bryant sharing time at the #2 spot. But then Romo got hurt. And without Romo Williams' promising start to the season fizzled out and he finished out the year in a serious decline. Now that the Cowboys finally had to cut the cord on the gargantuan Roy Williams contract it is easy to second guess what the Cowboys did a year ago. Sure, the Cowboys need help at wide receiver. But Crayton isn't exactly a young player and it would have made it very difficult to develop any young talent since Crayton wouldn't have been willing to take a lesser role in the offense while Kevin Ogletree and/or Dwayne Harris got on the field. Don't be fooled by the reporting that calls the trade from a year ago into question. It is easy to say what someone should have done a year later. But, at the time, the trade made perfect sense. Last season there was constant chatter about the Cowboys playing in the Super Bowl in their home stadium. The season before, in 2009, the Cowboys were coming off a 9-7 record and people weren't quite sure what to make of the team. It probably isn't the best comparison to draw based on how badly the season went last year. But which season was more fun for you as a fan? And I'm not just talking about the fact that the Cowboys won a playoff game following the 2009 season. I'm talking about that feeling of impending doom every time the Cowboys got off to a bad start in the game last season. For me it isn't always just being angry about the Cowboys losing the game. A lot of times it is partly due to knowing that I am going to have to endure razzing and teasing from an endless stream of people who come out of the woodwork when the Cowboys lose. But what makes so many of these haters so happy to see the Cowboys lose? A lot of times it is the way the media builds up the Cowboys before the season starts. The media has a tendency to pump up a lot of hype around the team and set unreasonable expectations. And the people who dislike the Cowboys always somehow spin the media comments into a feeling that the actual team has some sort of feeling of entitlement. Those of us who follow the Cowboys closely know that it is almost always the media talking big about the Super Bowl and not the actual members of the team. But the huge expectations built up by the media put a lot of people off. This year is different. No one really knows what to make of the team right now. It isn't trendy to pick the Cowboys to go deep into the playoffs. The hot picks this year are teams like the Philadelphia Eagles, Atlanta Falcons, New Orleans Saints and the New England Patriots. But you don't hear anyone talk about the Cowboys making a run deep into the playoffs. The Cowboys have big questions on the offensive line, the defense, at running back and even at kicker. So why would anyone pick the Cowboys as an odds on favorite right now? They really shouldn't. What makes a season the most fun for me is when the team exceeds all expectations. I think the Cowboys are primed for that type of year. They are still a very talented team. Sure, there are a lot of questions to be answered. But it isn't like the Cowboys are the Buffalo Bills. There is a lot of talent on the Dallas roster. And all of the big questions about the team aren't insurmountable. I doubt I'll be expecting the Cowboys to win the Super Bowl. I certainly would love to see it. But I will be thrilled if the Cowboys can find a way to qualify for the playoffs and win a playoff game or two. I'm not saying I won't be devastated if the Cowboys end up losing the NFC championship game. I'm just saying that the regular season will be much more enjoyable without the weight of unreasonable expectations weighing down the enjoyment of the season. The Cowboys finally got back to some "real" game action on Thursday night. While you can't really predict how good a team will be based on a preseason performance, you can evaluate individual players and get a feel for what the coaches are working on for the regular season. It was exciting to get a good look at what Rob Ryan's defense will look like this year. You immediately notice the change in the defense before the snap of the ball. Guys are moving, talking and causing confusion for the opposing offense. But you also see the boom or bust nature of the defense. When you bring players on blitzes from all over the field you are gambling that you will get to the quarterback before he finds the weakness in the coverage. It seemed that some of the starting defense is still trying to learn their assignments. The starting run defense needs work against the running game. The running backs for the Broncos weren't getting hit until they were 5 or more yards down the field on most plays. Sean Lee had a chance to make a big play on a run blitz but missed the tackle that would have resulted in a 4 yard loss. It was hard to get much of a feel for the passing defense for the starters. The majority of the Broncos offensive play calls were runs since they were so successful every time they ran it. But they did come up with a couple of nice stops on the goal line to force a short field goal by the Broncos. The starting offense looked sharp. Romo looked very comfortable in the pocket...no happy feet or bailing out to avoid contact as a result of last year's injury. Felix Jones had a nice run up the middle and broke a tackle for an 18 yard gain. Felix Jones looked much more comfortable running in the middle of the field than he did last season. I saw about 10 straight screen plays at the only training camp practice I attended. And it looks like all the work paid off. The kicking battle is fun to watch. Dan Bailey kicked the ball through the end zone on the opening kickoff and got the ball at least 5 yards deep in the end zone on every kickoff except the very last one. David Buehler just snuck a field goal inside the left upright from 42 yards that sure looked wide to me. It seems like the defensive players are much more aggressive about going after the ball to force a fumble. Maybe that is something Rob Ryan preaches because guys were clawing and punching at the ball on almost every tackle. The Cowboys don't seem to have much at punt returner behind Dez Bryant. Akwasi Owusu-Ansah dances around too much after he field the punt instead of getting up the field. Dwayne Harris ran backwards on his first two returns. With Martellus Bennett missing the game with a sore hamstring, John Phillips picked up where he left off last preseason before he was injured. It looks like Marty B. needs to start looking over his shoulder again. I didn't notice Tyron Smith very much which is a good thing. He was solid in pass protection although I thought he might have been partially responsible for a sack of Stephen McGee. From what I noticed he got the job done in the running game as well. I was happy to see the coaches get him a full half of playing time. It will be interesting to see if David Arkin has any real shot at starting this season. The coaches gave him a full half of playing time at left guard. I was hoping to get a good look at Lonyae Miller, but every time he got the ball it seemed like there was a breakdown in the run blocking. Either the blocking was really bad or he just isn't as good as some people thought. Phillip Tanner showed a lot more in his playing time than Miller did without a doubt. I'm glad that the Cowboys signed Abram Elam and Gerald Sensabaugh because Barry Church looks like he still needs some work. He made Tim Tebow look great by biting on a run fake and letting a receiver get behind him for a big gain. We aren't going to see many kick returns in the NFL this season based on this game. Most of the kickoffs resulted in a touchback. I was hoping to see something from Dwayne Harris and he didn't disappoint. He had a nice kick return and a monster game catching the ball. His best play was a short pass over the middle that he took 76 yards for a TD. But he also made a great play with 15 seconds left in the game to score his second TD of the game. He has a lot more speed than I thought but he certainly isn't a speed burner. With the Cowboys lack of depth at wide receiver he needs to be ready to play this season and he appears to be. I don't know what it is about Stephen McGee but the guy is just a winner. He plays average to poor for the majority of the game but when the clock hits 2 minutes in the 4th quarter he turns into Joe Montana. His pass on 4th and goal to win the game was awesome. He is really progressing into a decent backup quarterback. The only significant injury in the game appears to be a left shoulder injury to Danny McCray. No word yet on whether it will be a lingering problem but his X-rays were negative. 1. Does Tyron Smith look like the real deal? 2. Is there any chance that David Arkin can start at left guard in week 1 of the regular season? 3. How much of an upgrade is Abram Elam at safety? 4. Is there enough depth at cornerback on the roster? 5. Is Sean Lee ready to be the permanent starter at inside linebacker? 6. This will be the first of probably four weeks in the battle for the place kicker job. Will David Buehler or Dan Bailey take the lead in the battle? 7. Has Barry Church progressed from last season? 8. Does Dez Bryant look like he knows the offense better than last season? 9. Is John Phillips' knee 100%? 10. Could Lonyae Miller really make Tashard Choice expendable? 11. Is Brandon Williams finally ready to provide some depth at outside linebacker? 12. Is Shaun Chapas going to take the fullback job from Chris Gronkowski? 13. Is Dwayne Harris good enough to make a contribution this season? 14. Is Kevin Ogletree ready to step into the #3 receiver role or do the Cowboys need to go looking in free agency? 15. Does Jon Kitna have enough left in the tank to fill in for Romo if needed again? 16. How much of the new defense is installed? 17. Is the defense causing confusion and forcing the issue with the opposing offense? 18. Who is going to return kickoffs this year? 19. Does the team look more physical this season? 20. Does the team look more disciplined this season? Coming up with a list of 20 questions was really easy. And I could have kept going. That isn't necessarily a good thing. It means there are a lot of questions to be answered. We really don't know how good or bad this year's team can be yet. But this first preseason game will be the first true indicator of what we might see in the regular season. It will be fun to watch. Can the Cowboys Be a Playoff Team This Year? Now that the roster for the 2011 Dallas Cowboys is virtually complete it is finally possible to start thinking about how good the team can be. One of the big arguments being made against the team is that the majority of the roster is unchanged from last season. But that doesn't begin to tell the story of this team. Anyone who watched the team last year knows that 2010 was basically two seasons rolled into one. There was the Wade Phillips season and the Jason Garrett season. The second half of last season showed that there is enough talent on the roster to compete with any team in the league. There will be changes at both one starting safety position with Abram Elam taking over for Alan Ball. That is an obvious upgrade. Sean Lee may wrestle the starting role away from Keith Brooking while Brooking tries to regain his health. On offense the #3 receiver spot is still unsettled but it appears that Kevin Ogletree is doing his best to win the job. Many believe that the team will be better off without Roy Williams but his size gave an advantage in the red zone that is hard to match. Montrae Holland is penciled in at right guard but there is still a chance that the Cowboys could sign a free agent there or that David Arkin could take the job. And Tyron Smith will be the new starter at right tackle. So there are changes but not the type of wholesale roster turnover you would normally see from a team coming off of a 6-10 record. But with Jason Garrett running the show it appears that he has a coaching style that will get the most out of his talented players. And the new defensive coordinator, Rob Ryan, is bringing a new attacking style and a new attitude to the defensive side of the ball. Changing your defensive scheme is not just a small tweak so you can't just look at the players but you also have to consider the tactics. Tony Romo is the X factor in all of this. Sure, the team won some games with Jon Kitna and even Stephen McGee. But the playmaking ability of Tony Romo makes the offense exponentially better. If the offensive line can gel quickly and give Romo time there are a lot of weapons for opposing defenses to handle. Miles Austin, Dez Bryant, Jason Witten, and Felix Jones are four skill position players that can scare a defense as individuals let alone as a collective group. But it will all depend on how good the offensive line plays this season. If the line is even decent then you can expect the offense to be high scoring. Rob Ryan's defense is going to attack and confuse the opposing offense. The Cowboys will no longer line up a basic front and simply react to the offense. The defense will be aggressive and make big plays but probably also give up some big plays. But you can expect more sacks and turnovers and probably more defensive scores. I have no doubt that the defense will be improved this season. On special teams the big difference may be the kicker. David Buehler is in an intense battle right now for the starting kicker role with Dan Bailey from Oklahoma State. We all saw last season how erratic Buehler can be. He can make kicks under pressure and even hit game winners with the pressure on but he can also miss an extra point to help lose a game. I'll take consistency over the big leg any day. I just hope that the coaches go with the kicker who proves to be the most consistent during the preseason. So the big question is whether the Cowboys can make the playoffs this season. I think they absolutely have the talent to do it. But the biggest question mark for me will be the play of the offensive line. I believe the defense will be good enough to take the Cowboys deep into the playoffs based on scheme alone. But you have to score points to win and the Cowboys won't go very far if Tony Romo is running for his life every play. The Cowboys have four preseason games to get the reconstructed offensive line to gel. To me that will be the most interesting thing to watch as the preseason progresses. Hopefully we will see them improve as the preseason goes on. By the end of the next four weeks we should have a very good idea of just how good the Cowboys can be this year. It looks like the 2011 Dallas Cowboys have finally taken shape. With the signing of Gerald Sensabaugh and Abram Elam to one year contracts it would appear that the roster is very close to complete. There aren't any major holes remaining on the roster at this point. You could argue for wide receiver depth and cornerback depth but it seems as though the Cowboys want to go young there. It is expected that Sensabaugh and Elam will man the two starting safety spots with Barry Church and Akwasi Owusu-Ansah providing depth. I'm happy to have experience back there but I hope that the coaches are going to get the young guys some real game experience this season because they need to be ready to start next season. The best part about the two safety signings is the fact that the safeties came at relative bargain prices and the short term deals set things up for the young players to move into starting roles next season. I really like what I have seen from Barry Church in his limited time last season and from what I saw at training camp. He seems too good to get buried on the bench for much longer. Unfortunately Terence Newman went down with yet another injury at practice yesterday. But on the bright side it appears that he may be able to return for the season opener. The Cowboys do have some young players at cornerback who will need to step up. The silver lining here is the new defense that Rob Ryan is installing. With the multiple defensive looks they will give the offense and the blitzes coming from all over the field it makes the cornerback position a little easier to hide. But it still is a concern if Newman is expected to start and he is already out with an injury again. The Cowboys have managed to piece together their defensive line at a relative bargain by bringing back Marcus Spears and Jason Hatcher and signing Kenyon Coleman. Marcus Spears is a proven run stopper and Jason Hatcher has been a solid backup who get pressure the quarterback for the last few years. Adding Kenyon Coleman for depth makes sense because he has worked with Rob Ryan for the last two years in Cleveland. I was thrilled when I heard the Cowboys had resigned Marcus Spears a few days ago. While Stephen Bowen and Jason Hatcher have been solid contributors at defensive end there has always been a noticeable difference when Spears is out of the game. My only concern about Spears is the fact that he has really battled injuries over the last couple of seasons. But when Spears is healthy it is very difficult to run to his side of the field. I love the fact that the Cowboys brought Kenyon Coleman over from the Browns. His knowledge of the new defense will be invaluable. The defensive players have been talking about how many new defenses and schemes they have to learn in a very short period of time. Since Coleman is so familiar with the Rob Ryan defense he can essentially serve as an extra coach on the field to help the rest of the team learn the defense. And he started 14 games for the Browns last season so it isn't like he is some no name bench warmer coming to the team to ride the pine. He'll be part of the regular rotation in the defensive line. The Cowboys have still not addressed the safety position in free agency but that has to be the next move to expect. Abram Elam has been talking with the Cowboys and would be very valuable in the same way that Kenyon Coleman is because Elam has played for Rob Ryan for the last 2 years as well. Not only would he be a huge upgrade over Alan Ball last season but he also will be able to help keep the secondary organized in their new complex scheme. I'm hoping this is the next piece of the puzzle to fall into place heading into the start of preseason games.